On February 25th, the Sun let loose an X4.9-class solar flare. It was our parent star's most violent outburst of the year. 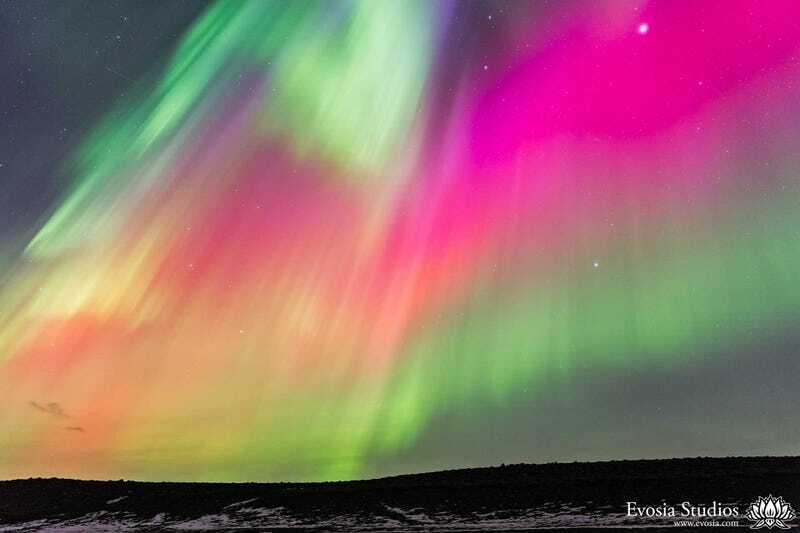 When the debris from the ensuing coronal mass ejection collided with Earth's atmosphere, it produced one of the most colorful auroral displays in recent memory. Watch a giant solar flare erupt out of the sun! I've come across photos of this particular light show before, and those images were stunning in their own right, but Lee's is the first video of the late-February aurorae that I've seen. From his footage, it's clear that that night's northern lights were unique. Charged particles riding a colossal gust of solar wind collided with elements in the atmosphere and set the sky vibrating, enveloping our starry dome in a vibrant, 360° view unmatched by weaker displays. "With shades of reds, purples, pinks and oranges, I felt I was on another planet in some scifi flick. I've seen other people's timelapses of northern lights but never in these colors nor so intense. Truly unreal." Pink aurorae are especially rare. When it comes to the Northern Lights, incoming electrons colliding with oxygen and nitrogen high in the Earth's atmosphere typically give rise to rippling sheets of green, red and blue. Pink results from a combination of the red and blue hues emitted by nitrogen molecules, and it's rare to see them as vibrant as they appear here. Add this to the growing pile of evidence that Iceland is a straight-up magical place and we should all probably move there. Feast your eyes on a rare lunar rainbow — against the Northern Lights! Be sure to check out more of Lee's work on his website.